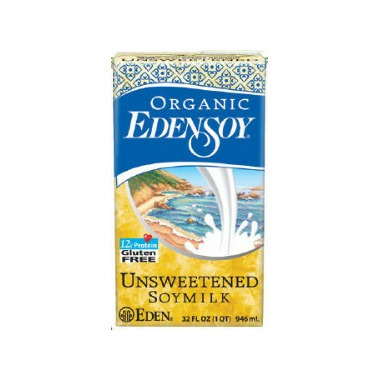 Eden Foods Edensoy Organic Unsweetened Soymilk is the highest in heart healthy whole soy protein of all soymilk with 12 grams per serving. Eden organic soybeans and pure water offer a good source of potassium, iron, folate B9, and magnesium, with 4.5 grams of omega 3,6, and 9 EFAs per serving. What I like of Eden products, this included, is that they do not include anything I do not expect. Just what needs to be there and it tastes good!